`Shipton & Tilman,’ the book by Jim Perrin. The day I went to interview Jim Perrin, I forgot to bring my camera. Unusual for mid-February, it had rained. It felt like early September, the relatively weak, tapering part of monsoon with grey sky and reluctant sun. In his room at the Royal Bombay Yacht Club, Jim sat facing the rain tinged light of the window. Beyond it was the road leading to the Gateway of India. The light filtering in graced the room, built big to colonial dimension and still preserved in the old style. Jim rested his back on one armrest and slung his legs over the other. He recalled his life writing about climbers. In that borderland of writing and climbing, one of the things he ended up doing was writing obituaries. He wrote many. Then, there are those three books, conceived long ago as a trilogy, each representing an influential person or phase in British climbing. John Menlove Edwards the subject of the first book in the series had been a gifted rock climber and writer. 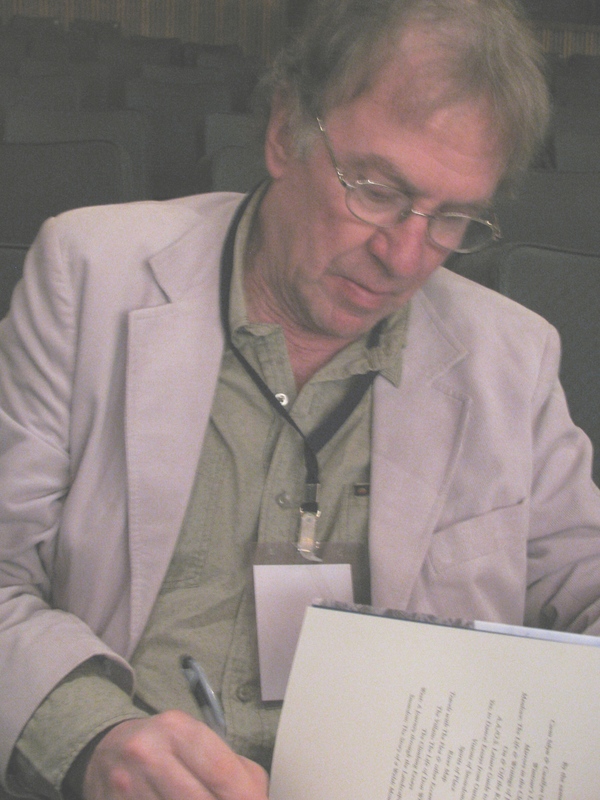 Don Whillans, the topic of the second book in the trilogy, personified the gate crashing outsider. Until then, mountaineering had been the preserve of an elite, class conscious imagination. Whillans gate crashed the party but the very force that made him would also be his undoing. Jim, a rock climber in his younger days, knew Whillans. The overcast sky dispatched a pool of diffused light to where Jim sat. I tried my best to focus on Jim talking but my mind couldn’t help regretting the photograph of writer in that room, missed. Few hours after our chat, Jim received the Kekoo Naoroji Award from the Himalayan Club, for his third book – the last of the trilogy – on the remarkable partnership between Eric Shipton and Bill Tilman. In India, the duo are best remembered as explorers of the Himalaya, two mountaineers who worked together to fashion an approach to the iconic 7816m-high Nanda Devi. That peak is the heart beat of Kumaon. In August 1936, Tilman and Noel Odell would become the first party to summit the peak. Although he partnered Tilman in finding a route to Nanda Devi (it sits well guarded by a wall of other high mountains), Shipton had opted for Everest, when this eventually successful expedition came by. He never reached Nanda Devi’s summit. But Shipton-Tilman was more than Nanda Devi. Mountaineering is a harsh sport. Sure there is what nature throws at you. But there is also the mix of personal ambition and high adventure through natural hazards faced, which forces an evaluation of self and others that is heartless and very often, the stuff of anger, regret and acrimony. Egos clash. Teams break up. Many times, friendship and break-up have happened all in the space of one expedition. Shipton-Tilman was different. Their friendship endured and even after the two men – each quite different from the other in terms of character and yet somewhere similar – stopped climbing together, they maintained their mutual respect. 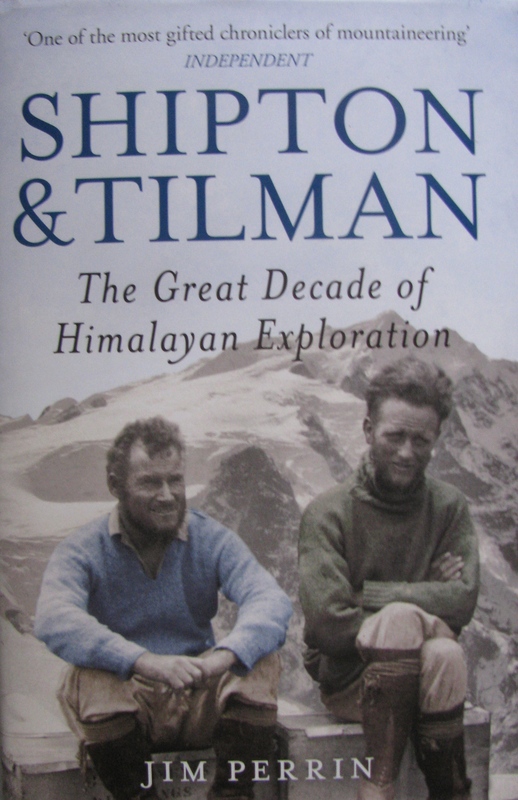 For many Indian mountaineers in their middle age now or past it, Shipton-Tilman is the ideal. Further their legacy is in a class of its own. The books they wrote together and separately are considered classics of outdoor writing. I read my first Tilman in my forties much after the world of climbing had been invaded by modern media leading us to believe that nobody told climbing’s story as well as we did. That’s the mark of our times. Reading Tilman was an invitation to correct such arrogance. His writing engaged and the imagination in it captivated for the questions it posed and the style it adopted so many years ago. It was humbling. Core to the world of mountaineering and aside from their lasting partnership, Shipton-Tilman are remembered for a couple of other reasons. First, they are among the last classical explorers of the Himalaya and the exploration of a route to Nanda Devi was one fantastic story. Second, while the mountaineering style between the great wars of the twentieth century endorsed both the ideals of empire and climbing in military style-expeditions, this twosome ventured forth in lean teams, interacted with the local people and lived off the land. Today we call such lean climbing – alpine style ascents. The British mountaineering establishment of the days when Shipton-Tilman climbed couldn’t gauge the potential impact of their style, till fault and criticism progressively caught up with the practice of giant expeditions. As empire faded, so did the reverence for old siege and assault styles. But Shipton-Tilman lived on as `alpine.’ From a writer’s perspective, these two men pose a unique challenge. Despite books they wrote and books about them, there is little providing insight into their formative years. In their accounts, both men don’t indulge this angle. In reality, Shipton’s childhood and youth are relevant to understand him as is Tilman’s military experience during World War I. One took his chances with women; the other was called misogynist. Jim tries to explain the two characters well, with detailed research and at times, educated guess based on personal knowledge. For instance – he knew Tilman. After approximately a third of the book read and the rest skimmed through to confirm its flavour, Jim Perrin’s book came across as a study. It is not the typical climbing story. The narrative of the Shipton-Tilman climbs is already out there. Jim’s is a writer’s journey into their separate stories, their separate characters, their association as a team and what they possibly meant in their writings (Jim puts it in perspective). It is also therefore a book based on many other books. So, more than climbing, it is literature and scholarship, a valuable insight into the greatest partnership in mountaineering. According to Jim, the book had been thirty years in the making. Asked why he restricted himself to writing on British climbers, he said that he preferred to write on subjects he knew. To me, that’s one more reason as to why Jim’s book matters. When we finished chatting and it was time for lunch, I recommended a well known upmarket restaurant in Colaba. He agreed to it but then asked, “ Can I get aloo paratha?’’ So we ended up in a decidedly less expensive place, filled with chatter, tea and Indian food. Days later as I started reading Jim’s book, I noticed how it began with deep appreciation for the aloo paratha and tea he had enjoyed, at a dhaba near Gaumukh. In the early 1970s, Dr Shekhar Pathak and Kundan Singh Rawat were students at Almora. Pathak was the editor of the college magazine. That was Pathak’s introduction to Kundan’s less known side – he was the great grandson of Nain Singh Rawat, one of the Pundit brothers from Kumaon’s Johar valley near Munsyari, famous for the work they did in mapping and documenting Tibet. In the early nineteenth century, the British were hungry for cartographic details of a mysterious Tibet closed to Europeans. The desire for information was catalysed by the Great Game, that shadow dance of mutual intrigue enacted by Russia and Britain to extend their influence in Asia, particularly the Himalaya and Central Asia. Each worried that the other would dominate the region; their competition made little known kingdoms and places on the map, suddenly important. The effort to know these places triggered exploration and military campaigns, altogether lasting approximately a century. The work Nain Singh and his fellow surveyors produced dwarfs political motives that may be attributed to their journeys. It brought to light many details of the Himalaya, like the eastern course of the Tsangpo useful to establish that this big river in Tibet and Assam’s Brahmaputra were one and the same. Nain Singh travelled in disguise usually as a Tibetan monk, surveyed without complicated instruments and concealed the data in prayer wheels. He trained to walk with strides of a particular length always so that distances could be measured. Unlike travel for leisure, which is what many of us do, this was dedicated, disciplined work. Years later, when Sir Francis Younghusband led British forces to Lhasa, his surveyors would discover that Nain Singh’s records were accurate and reliable despite the few resources he worked with. Pathak had been previously drawn to Nain Singh Rawat during his periodic visits to the office of `Shakti,’ a newspaper published from Almora. Their calendar had featured important personalities of Kumaon; including Nain Singh Rawat and Kishen Singh Rawat, the best known of the Pundits. `Pundit,’ a title conferred on teachers, was how the British addressed their Hindu surveyors. Kundan’s article interested Pathak. He helped edit the piece, little knowing where the curiosity would take him. In October 1973, Pathak trekked to the Pindari Glacier and wrote a travelogue, later published in `Shakti.’ It quoted from the book `One Dimensional Man’ by Herbert Marcuse. The article was seen by Sunderlal Bahuguna, closely identified with the Chipko Movement, one of the most important environmental campaigns of modern India. In December 1973, Bahuguna spun the idea of a walk from Askot to Arakot, an east-west traverse of the Central Himalaya region now falling in the state of Uttarakhand. To maximize the education and awareness about villages and people en route, it was decided that participants – including Pathak – would carry no money. Although Pathak couldn’t do the route entirely given his college exams, four people – Kunwar Prasun, Shekhar Pathak, Shamsher Bisht and Pratap Shikhar – walked much of it during May-July 1974. By December that year, Pathak had joined the Kumaon University to teach history. He was based mostly in Nainital; he would take his PhD in 1980 and go on to become one of the best known historians from Kumaon. The interest in Nain Singh Rawat continued. In 1975, `Saaptahik Hindustan,’ a weekly magazine, carried an article by Dr Ram Singh, then a lecturer in Hindi literature with keen interest in history, on Nain Singh Rawat. The article quoted from the explorer’s diaries. This was the first time Pathak heard of Nain Singh’s diaries. 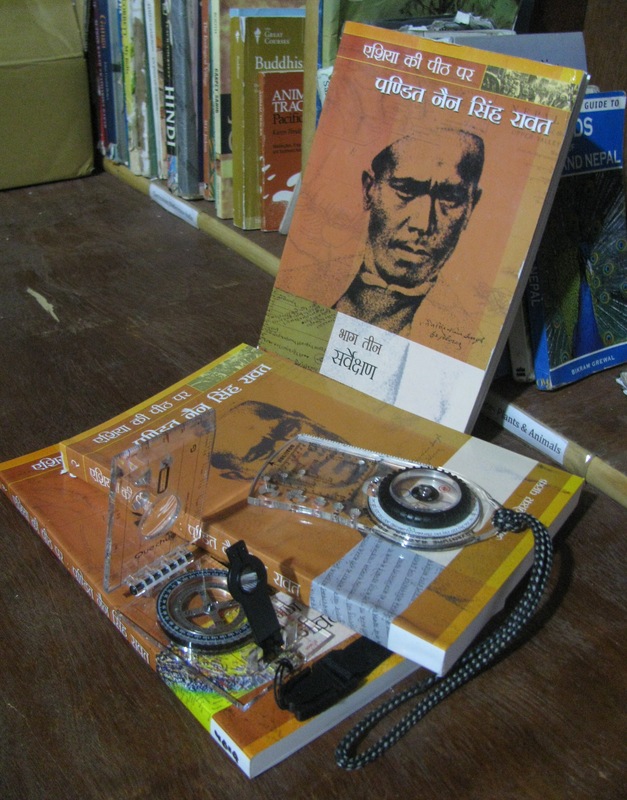 According to Pathak, Kabindra Shekhar Upreti, who had taught many years in lands inhabited by the Bhotias, was instrumental in bringing the diaries to light. He was principal of the Government Intermediate College in Munsyari, when somebody showed him the diaries. 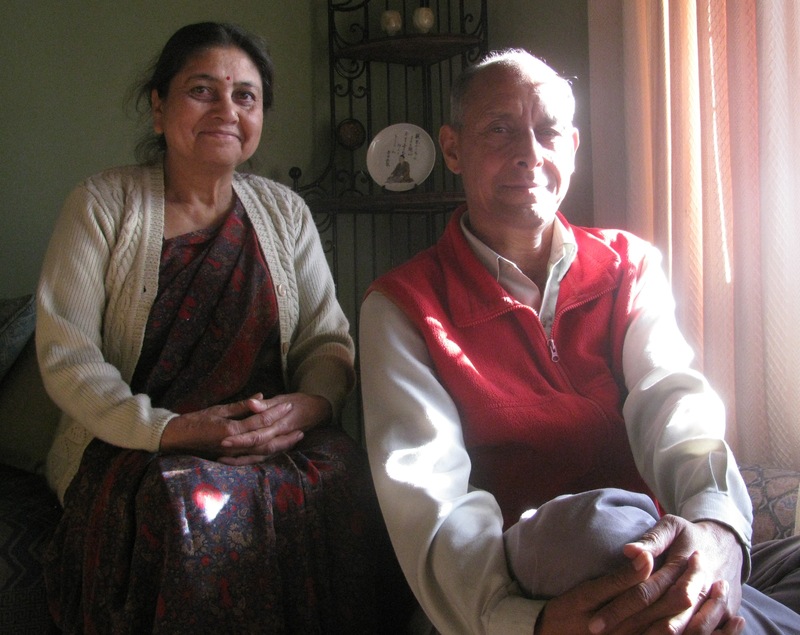 After retirement, Upreti, moved to Nainital bringing along with him the two Nain Singh diaries. “ Seeing the diaries was a revelation,’’ Pathak said. The first of these diaries was quite autobiographical providing previously unknown vignettes of the explorer’s early years including his father’s life. Upreti had taken care to wrap the old diaries in a piece of cloth, a level of care that does not appear to have graced all subsequently recovered vestiges of Nain Singh’s work. The year was probably 1976. Nainital had Nain Singh’s diaries, a community of intrigued researchers and no photo copying machines to make copies of the diaries for study and ensure that the originals were undisturbed. By 1982, Pathak would be a founder of the People’s Association for Himalaya Area Research (PAHAR). This organization brings out a publication called PAHAR, of which Pathak is founder editor. Kamal Joshi, a keen trekker, student of chemistry and later photo editor of PAHAR, was at hand to help when the Nain Singh diaries reached a Nainital with no photo copiers around. He set up a temporary dark room and photographed and printed each page of the diary, probably a hundred in all. Over three years – 1976, 1977 and 1978 – Pathak, his wife Dr Uma Bhatt – she is a Hindi scholar – and their friends, wrote Nain Singh’s diary on paper. Now they were getting an insight into the person and for Uma, a way to look at the explorer through his language and style of writing. According to her, Nain Singh wrote in a form of Hindi that can be described as `Khadi Boli,’ which is not chaste Hindi but a Hindi mixed with Persian words. It is a more spoken form of the language and to that extent probably easily connecting to an audience. “ Nain Singh’s diaries can be considered to be one of the first such travelogues in Khadi Boli Hindi,’’ she said. In 1978, another diary surfaced at the house of a freedom fighter. This time, it wasn’t in Nain Singh’s hand writing, it had been copied and translated into English. Half of this diary was personal; another half was related to his first trip into Tibet. But there were sections missing. All the diaries were typed out. In 1985, one of Nain Singh’s diaries – on his second journey to Tibet – was published as a seven part-series in `Nainital Samachar,’ a local fortnightly. In 1986, Pathak presented a paper on the importance of vernacular diaries with Nain Singh’s work as case in point, at the Indian History Congress. PAHAR, the journal, also published portions of the explorer’s diaries. In 1985, `Himalaya Today’ published a long article on Nain Singh Rawat authored by Dr Pathak and Dr Uma Bhatt. Years of seeking to know about Nain Singh’s life made Pathak look for details wherever he went. In 1984 on a repeat of the earlier Askot to Arakan walk, at Madkot village, he was shown the original primer for surveying – a text book for surveyors – which Nain Singh had written and was published by the Survey of India in 1871. In 1994, while on a visit to Pakistan, some German friends helped him access relevant portions of the seven-volume report of the Schlagintweitt Brothers, German geographers with who Nain Singh had done his first trip of exploration in the Himalaya. The full report of the Schlagintweit Brothers, Pathak saw some years later in Stockholm and still later, at the Survey of India. In 1991, Pathak himself went to Kailas Manasarovar; in 1996 and in 2006 he visited Lhasa, in 2002 he visited parts of Tibet to the north of Everest (he crossed from the Nepal side). The eastern extreme of Nain Singh’s travels – the subject of his epic last journey from Ladakh to Tawang – Pathak managed to get some idea of that in 1992-1993, through visits to Arunachal Pradesh. Some of these trips, Pathak said, had been emotional. Eventually, as a researcher at the Delhi based-Nehru Memorial Museum and Library, Pathak gained access to the Survey of India archives at Dehradun and records at their old office in Kolkata (Calcutta). In 2006, PAHAR published a three volume set called `Asia Ki Peeth Par’ (On the Back of Asia: life, explorations and writings of Pundit Nain Singh Rawat) compiling Nain Singh Rawat’s diaries and the reports on his journeys submitted by the British. Nain Singh was born in the same year as the Royal Geographical Society was founded. The Society awarded him the Patron’s Medal in 1877. In deliberations preceding this and to impress upon the Society the magnitude of this exploration by a non-European, Col Henry Yule, who would be vice president of the Society from 1887 to1889, argued that Nain Singh’s contributions were best compared in the western world to the likes of David Livingstone and “Grant,’’ most likely James Augustus Grant. Kundan Singh Rawat, the man responsible for inspiring Dr Pathak’s forty year-old journey with Nain Singh Rawat’s story, is no more. In 2004, the Indian government brought out a postage stamp featuring Nain Singh. Despite books by Dr Pathak, Dr Uma Bhatt and others, including mention in popular books by foreign authors on the Great Game and the exploration of the Himalaya, Nain Singh Rawat remains little known outside the state of Uttarakhand.